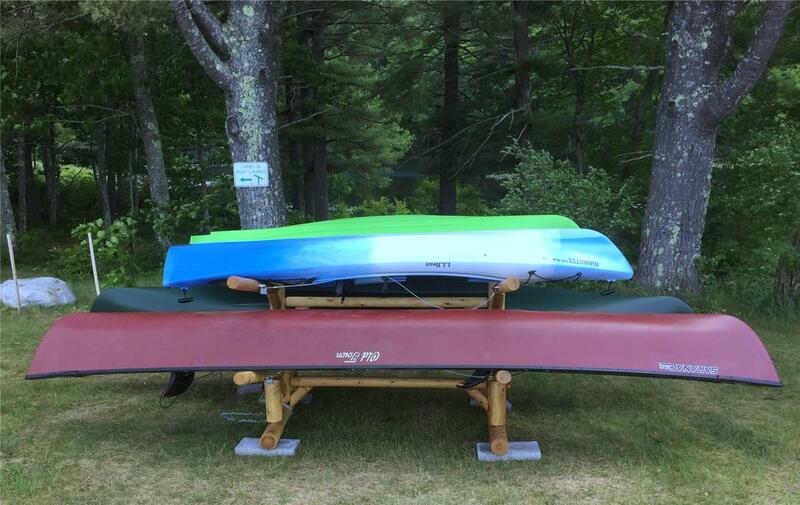 Two canoes and two kayaks, donated by L.L. Bean, are available for use at the Royal River Reservoir. New Gloucester residents now have another recreational opportunity courtesy of their town’s Parks and Recreation Committee. Its members worked in conjunction with L.L. Bean, which donated two canoes and two kayaks, as well as with the Royal River Conservation Trust from which a grant was made available to purchase related equipment, such as personal floatation devices. The new launch, which accesses the Royal River Reservoir, is located at the New Gloucester Fairgrounds, 106 Bald Hill Road. The procedure to sign out the boats is as follows. 1. Pick up a key at New Gloucester Library after you fill out the proper paperwork. Refer to www.newgloucester.com for library hours. 2. At the fairgrounds, unlock the vessels that you have signed out along with the personal floatation devices (PFDs) and paddles that you need. 3. Boats can only be launched and taken out at the fairgrounds launch. Boats cannot be transported off-site. 4. PFDs and paddles are located in the green job site box next to the canoe and kayak rack (use same key to unlock). Please note that PFDs must be worn at all times when you are using any of the watercraft. 5. When you are done, return the watercraft to the rack and relock them. Please be sure that they are secured correctly. 6. Place the PFDs and paddles back in the green job site boxes and lock it back up. Contact New Gloucester Parks and Recreation Director Harvey Price Jr. at 926-4126 ext. 231 or hprice@newgloucester.com for more details. The 3rd annual New Gloucester Chicken Barbecue will be held on Saturday, July 9, beginning at noon at Amvets Post 6, 1095 Lewiston Road/Route 100. The barbecue will consist of a full chicken dinner, beverage and Hodgman’s Frozen Custard. The Berry, Berry Good Band will perform. The cost is $8 for adults and $4 for children, and proceeds will benefit the New Gloucester Veterans’ Monument. Call Jean Libby at 926-4538 for more information. The New Gloucester Bible Church, 218 Lewiston Road, will be diving into Noah’s Flood with their “Answers in Genesis” Ocean Commotion Vacation Bible School. For ages 3-12, it takes place daily Monday, July 11, through Friday, July 15. There will be arts and crafts, fun and games, snacks, Bible lessons, songs and gymnastics – and it’s all free. Call Connie or Dan Michaud at 926-3140 or just come. Would you like to show off your beloved animal and meet other interesting pets? Come to the New Gloucester Public Library, 389 Intervale Road, 6:30 p.m., Tuesday, July 12, for their 14th annual Pet Show. All pets are welcome to attend for pet-themed storytime, socializing, and species-appropriate snacks. Light refreshments will be served for the human types. A representative from the GNG Animal Hospital will be on hand for a fun presentation. An additional exciting group will be here this year for your entertainment. All pets are welcome, be they scaly, furry, feathered, finned, imaginary, slithery or stuffed. For more information, contact Carla at 926-4840. Registration is appreciated. The Gray-New Gloucester Summer Food Service Program provides a fun, safe place for all children age 18 and under to eat a healthy meal. No application is needed, and the meal must be eaten on site. There are two sites in New Gloucester. The Memorial School playground is located at 86 Intervale Road, Route 231. Meals there will be served on weekdays, from 11-11:30 a.m., July 25 through Aug. 26. The other site is the New Gloucester Fairgrounds, 106 Bald Hill Road. The dates and times are to be determined. The Gray-New Gloucester Summer Food Service Program is sponsored by MSAD 15 Food and Nutrition Services in partnership with the Liberty Family Foundation. For more information, contact Amy Bacon at 653-9474 or abacon@sad15.org. Find the Gray locations and times at www.msad15.org.